The first glass specifically designed to showcase our Boston Lager as the brewers intended. In June 2008, we embarked on a journey to help small businesses and brewers achieve their dreams. Samuel Adams sets superior standards for quality craft beer. 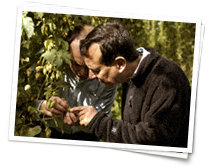 Insisting that only the world's finest ingredients make the best beer, Jim and the other brewers at Samuel Adams travel the world to hand select the hops, barley, and other ingredients that go into each brew. In fact, on Jim's annual hops selection trip to Bavaria, the hops farmers always comment on how Jim doesn't just sniff the hops, he “dives” into them. In order to ensure that drinkers enjoy only fresh Samuel Adams beer, the way the brewers intended, Jim created consumer-readable freshness dating in 1988. Beer with natural ingredients and no preservatives, like Samuel Adams, has a limited shelf life and begins to change over time as it ages. Easy-to-read freshness dating on our labels shows drinkers the last month in which they should drink a Samuel Adams beer. Today, Samuel Adams is one of the only brewers with a cooperative program with its distributors to buy back its beer when it is past its peak freshness date. 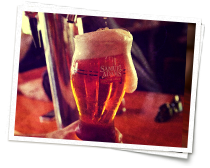 In 2007, Samuel Adams unveiled the Samuel Adams Boston Lager Pint Glass, which Jim says is the first glass specifically designed to showcase Boston Lager as the brewers intended. With the help of world-renowned sensory and glassware experts, TIAX Sensory and Rastal, Jim and the brewers created a glass that helps sustain the head of the beer, enhance aroma, and maintain temperature. Samuel Adams announced in February 2013 that for the first time Samuel Adams Boston Lager would be offered in the new Sam Can. The new can design was the result of two years and a $1 million investment in ergonomic and sensory research and testing. 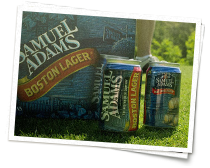 Jim’s end goal in developing a new can was to provide drinkers with the best possible Boston Lager drinking experience when they prefer the convenience of a can without compromising the taste of his first and favorite beer, Samuel Adams Boston Lager. In 1995, The Boston Beer Company, Inc. went public, selling shares of Class A Common Stock on the New York Stock Exchange under the symbol SAM. Today, Boston Beer employs more than 1,400 individuals who are as equally passionate as Jim when it comes to rich, full-flavored beer. In addition to the world-class Samuel Adams family of beers, The Boston Beer Company also brews under the trade names, Angry Orchard Cider Company and Twisted Tea Brewing Company. In 2011, Samuel Adams created the first “craft beer incubator” through a subsidiary company, A&S Brewing, which seeks to research and discover exceptional beer styles (styles that exist, used to exist and don’t yet exist) and make them available to craft beer drinkers. 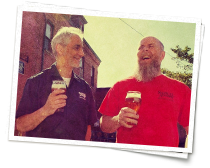 Without the capital to build a world-class brewery, Jim began by brewing in a century-old brewery in Pennsylvania, while renovating part of the old and largely abandoned Haffenreffer Brewery in Boston. With renovations complete, the Samuel Adams Boston Brewery opened in 1988 and today serves as the research and development brewery, as well as a site for devoted drinkers to tour and sample unique styles of Samuel Adams beer. In the mid-1990s, Jim returned to his hometown of Cincinnati to purchase the Hudepohl-Schoenling Brewery, a place where his father had apprenticed in the 1940s. Then, in June of 2008, The Boston Beer Company took ownership of a world-class brewery with a distinguished history of brewing great beers, located in the Lehigh Valley of Pennsylvania. In 2013, A&S Brewing opened the doors of the Angel City Brewery in Los Angeles, California. In May 2015, A&S Brewing opened the Concrete Beach Brewery, a brewery and social hall in the Wynwood Arts District of Miami. In August 2015, A&S opened up Coney Island Brewery in the Coney Island section of Brooklyn. In November 2015, Boston Beer opened its Angry Orchard and Innovation Cider House in Walden NY. From the very beginning, Jim Koch wanted to create a company that he would want to work for. Specifically, he created a culture that celebrated beer with a passion and a depth of knowledge that can’t help but be contagious to others. Everyone at the Boston Beer Company shares a love of great beer. The company works hard to maintain that culture through the successes and growth it has seen over the years. Boston Beer has been cited as one of the best companies to work for by Boston Magazine. In June of 2008, Jim was inspired by his own experiences to create a philanthropic program that would provide support to small businesses and rising entrepreneurs in America. The result was Samuel Adams Brewing the American Dream. 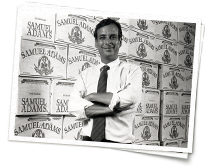 Through Brewing the American Dream, Samuel Adams offers mentoring and small business loans to small business owners in food, beverage, hospitality and craft brewing. With the help of Accion, the largest nationwide micro- and small business lending network in the U.S., Samuel Adams has distributed more than $4 million dollars in capital to hundreds of small food and beverage businesses enabling them to create or save thousands of jobs, between 2008 and 2014. 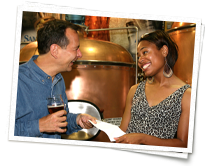 Boston Beer also offers the Brewing and Business Experienceship to one craft brewer annually to receive educational and enrichment experiences from the Samuel Adams brewery and its employees. In 2014, Boston Beer again expanded the program, making an additional philanthropic investment of $1 million to support small business owners through speed coaching events in more cities and additional microloans. Never satisfied just to make his own version of existing beer styles, Jim pioneered the “extreme” brewing movement in the early-1990s. 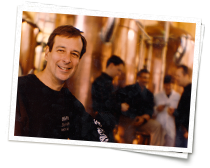 Jim first brewed Samuel Adams Triple Bock in 1993, followed by Samuel Adams Millennium Ale in 2000, and the world’s most extreme naturally-fermented beer, Samuel Adams Utopias in 2002, 2003, 2005, 2007, 2009, 2011, 2013, 2015 and 2017. 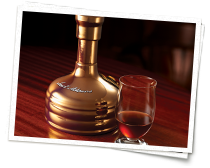 These beers stretch the very definition of beer and rival some of the world's finest cognacs and ports. In 2010, Jim continued to push the envelope in brewing with the release of Infinium, the culmination of a two-year collaboration between Samuel Adams and Germany’s Weihenstephan Brewery. Combining the breweries’ 1,000 years of brewing expertise and creativity, Infinium marked the first new beer style created under the Reinheitsgebot in over a hundred years. Samuel Adams collaborated with Berkshire Mountain Distilling to begin distilling two beers in 2012, Samuel Adams Boston Lager and Samuel Adams Cinder Bock, into two never-before tasted whiskies, further pushing the envelope of beverage innovation. Berkshire Mountain Distiller began selling the whiskies through its distribution network in late 2016. The Boston Beer Company has always shared a common passion for bringing great Samuel Adams beers to beer lovers everywhere. Boston Beer’s creativity has allowed Samuel Adams to stay ahead of its competition, while at the same time helping grow the world of craft beer. At Boston Beer, we’re not bound by traditional modes of thought and our brewers continuously strive to think outside the kettle. Fundamental to Boston Beer’s continued success is a sense of awe at all there is yet to accomplish and create. As a brewery, Samuel Adams looks at the world as one without limits, in which it is free to explore, grow, create, and enjoy. Although proud of what we’ve achieved thus far, we look forward to the opportunities and possibilities that lie ahead.